Sovereign debt is growing internationally at a terrifying rate, as nations seek to prop up their collapsing economies. One only needs to look at the sovereign risk pressures faced by Greece, Spain, and Ireland to get an idea of how big this problem has become. Understanding this dilemma is now more important than ever, that's why Robert Kolb has compiled Sovereign Debt. With this book as your guide, you'll gain a better perspective on the essential issues surrounding sovereign debt and default through discussions of national defaults, systemic risk, associated costs, and much more. Historical studies are also included to provide a realistic framework of reference. The repercussions of a national default are all-encompassing as global markets are intricately interwoven in the modern world. Sovereign Debt examines what it will take to overcome the challenges of this market and how you can deal with the uncertainty surrounding it. Robert W. Kolb (Chicago, IL) is the Frank W. Considine Chair of Applied Ethics and Professor of Finance at Loyola University, Chicago. Prior, he was the Assistant Dean, Business and Society, and Director, Center for Business and Society, at the University of Colorado at Boulder, Department Chairman at University of Miami, and he also taught at Emory University and University of Florida. Professor Kolb is the author of over 20 books on finance, derivatives, and futures, and has authored numerous articles in leading finance journals such as Financial Review, Journal of Futures Markets, Journal of Financial Engineering, Journal of Financial Economics, and Journal of Portfolio Management, among many others. Part I: The Political Economy of Sovereign Debt. 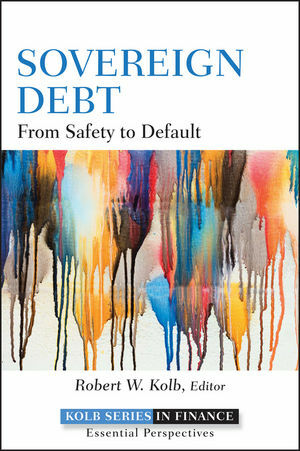 1 Sovereign Debt: Theory, Defaults, and Sanctions (Robert W. Kolb). 2 The Institutional Determinants of Debt Intolerance (Raffaela Giordano and Pietro Tommasino). 3 Output Costs of Sovereign Default (Bianca De Paoli, Glenn Hoggarth, and Victoria Saporta). 4 Spillovers of Sovereign Default Risk: How Much is the Private Sector Affected (Udaibir S. Das, Michael G. Papaioannou, and Christoph Trebesch). 5 Sovereign Debt Problems and Policy Gambles (Samuel W. Malone). 6 Sovereign Debt and the Resource Curse (Mare Sarr, Erwin Bulte, Chris Meissner, and Tim Swanson). 7 Sovereign Debt and Military Conflict (Zane M. Kelly). Part II: Making Sovereign Debt Work. 8 Fiscal Policy, Government Institutions, and Sovereign reditworthiness (Bernardin Akitoby and Thomas Stratmann). 9 Corruption and Creditworthiness: Evidence from Sovereign Credit Ratings (Craig A. Depken, II, Courtney L. LaFountain, and Roger B. Butters). 10 Institutions, Financial Integration, and Complementarity (Nicola Gennaioli, Alberto Martin, and Stefano Rossi). 11 Loans versus Bonds: The Importance of Potential Liquidity Problems for Sovereign Borrowers (Issam Hallak and Paul Schure). 12 First-Time Sovereign Bond Issuers: Considerations in Accessing International Capital Markets (Udaibir S. Das, Michael G. Papaioannou, and Magdalena Polan). 13 A Note on Sovereign Debt Auctions: Uniform or Discriminatory (Menachem Brenner, Dan Galai, and Orly Sade)? 14 Pension Reform and Sovereign Credit Standing (Alfredo Cuevas, María González, Davide Lombardo, and Arnoldo López-Marmolejo). Part III: Sovereign Defaults, Restructurings, and the Resumption of Borrowing. 15 Understanding Sovereign Default (Juan Carlos Hatchondo, Leonardo Martinez, and Horacio Sapriza). 16 Are Sovereign Defaulters Punished? : Evidence from Foreign Direct Investment Flows (Michael Fuentes and Diego Saravia). 17 Supersanctions and Sovereign Debt Repayment (Kris James Mitchener and Marc D. Weidenmier). 18 Debt Restructuring Delays: Measurement and Stylized Facts (Christoph Trebesch). 19 IMF Interventions in Sovereign Debt Restructurings (Javier Díaz-Cassou and Aitor Erce). 20 Resuming Lending to Countries following a Sovereign Debt Crisis (Luisa Zanforlin). Part IV: Legal and Contractual Dimensions of Restructurings and Defaults. 21 A Code of Conduct for Sovereign Debt Restructuring: An Important Component of the International Financial Architecture (Kathrin Berensmann)? 22 Governing Law of Sovereign Bonds and Legal Enforcement (Issam Hallak). 23 Sovereign Debt Restructuring: The Judge, the Vultures and Creditor Rights (Marcus H. Miller and Dania Thomas). 24 Sovereign Debt Documentation and the Pari Passu Clause (Umakanth Varottil). 25 Collective Action Clauses in Sovereign Bonds (Sönke Häseler). 26 Sovereignty, Legitimacy, and Creditworthiness (Odette Lienau). 28 Insolvency Principles: The Missing Link in the Odious Debt Debate (Mechele Dickerson). 29 The Baring Crisis and the Great Latin American Meltdown of the 1890s (Kris James Mitchener and Marc D. Weidenmier). 30 How Government Bond Yields Reflect Wartime Events: The Case of the Nordic Market (Daniel Waldenström and Bruno S. Frey). 31 How Important Are the Political Costs of Domestic Default? : Evidence from World War II Bond Markets (Daniel Waldenström). 32 Emerging Market Spreads at the Turn of the Twenty-First Century: A Roller Coaster (Sergio Godoy). Part VI: Sovereign Debt in Emerging Markets. 33 Sovereign Default Risk and Implications for Fiscal Policy (Gabriel Cuadra and Horacio Sapriza). 34 Default Traps (Luis A.V. Catão, Ana Fostel, and Sandeep Kapur). 35 Self-Fulfilling and Self-Enforcing Debt Crises (Daniel Cohen and Sebastien Villemot). 36 The Impact of Economic and Political Factors on Sovereign Credit Ratings (Constantin Mellios and Eric Paget-Blanc). 37 Sovereign Bond Spreads in the New European Union Countries (Ioana Alexopoulou, Irina Bunda, and Annalisa Ferrando). 38 Can Sovereign Credit Ratings Promote Financial Sector Development and Capital Inflows to Emerging Markets (Suk-Joong Kim and Eliza Wu)? 39 Country Debt Default Probabilities in Emerging Markets: Were Credit Rating Agencies Wrong (Angelina Georgievska, Ljubica Georgievska, Dr Aleksandar Stojanovic, and Dr Natasa Todorovic)? 40 The International Stock Market Impact of Sovereign Debt Ratings News (Miguel A. Ferreira and Paulo M. Gama). Part VII: Sovereign Debt and Financial Crises. 41 Equity Market Contagion and Co-movement: Industry Level Evidence (Kate Phylaktis and Lichuan Xia). 42 An Insolvency Procedure for Sovereign States: A Viable Instrument for Preventing and Resolving Debt Crises (Kathrin Berensmann and Angélique Herzberg)? 43 From Banking to Sovereign Debt Crisis in Europe (Bertrand Candelon and Franz C. Palm). 44 From Financial Crisis to Sovereign Risk (Carlos Caceres, Vincenzo Guzzo, and Miguel Segoviano). 45 Sovereign Spreads and Perceived Risk of Default Re-Visited (Abolhassan Jalilvand and Jeannette Switzer). 46 What Explains the Surge in Euro Area Sovereign Spreads During the Financial Crisis of 2007-09 (Maria-Grazia Attinasi, Cristina Checherita, and Christiane Nickel)? 47 Euro Area Sovereign Risk During the Crisis (Silvia Sgherri and Edda Zoli). 48 Facing the Debt Challenge of Countries That Are “Too Big To Fail” (Steven L. Schwarcz).